Protect Wisconsin Waterways, the Rock River Storm Water Group, and UW-Whitewater at Rock County are excited to host the Rock County Wisconsin Waterways ROCK Summer Camp! Why: Our goal is to inspire Wisconsin’s youth to be mindful and active in participating in safer stormwater practices. This camp will foster a profound academic experience that will make a splash in your child’s life. At the camp, the kids will enjoy activities such as a nature walk, building their own portable rain garden and terrariums, trivia, tie-dying shirts, stream monitoring, a river clean-up, and so much more! 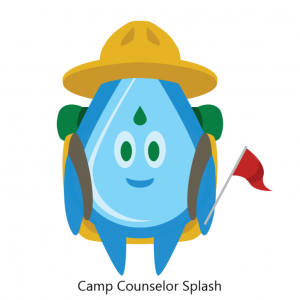 They can also expect a visit from the Protect Wisconsin Waterways mascot, Splash, during the summer camp! This educational summer camp will not only teach your kids how to protect our waterways, but they will have fun while they do it. With plenty of hands-on activities, this engaging summer camp is sure to be the highlight of your kids’ summer! To register your kids today, visit the UW-Whitewater at Rock County page! Stay up to date on camp information by following us on social media, too!